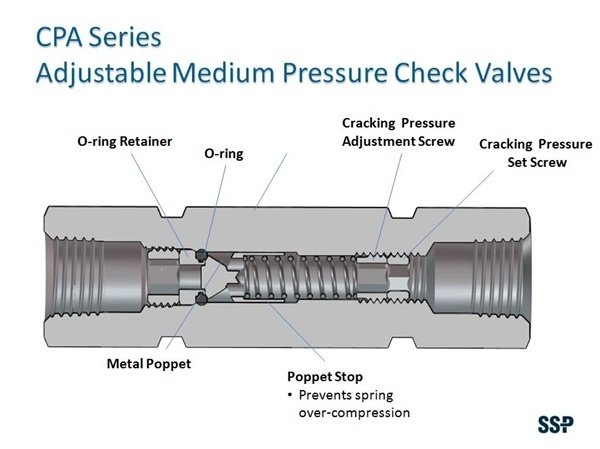 The CPA Series check valves feature adjustable cracking pressures enabling instrumentation and process system designers and installers to fine tune cracking pressures to more precisely meet system requirements. Select CPA Series Adjustable Check Valves for your applications. O-ring Materials: Fluorocarbon FKM, Nitrile, low-temp Nitrile, ethylene propylene, and perfluorocarbon elastomer FFKM. Cracking Pressures: 3 to 50, 50 to 150, 150 to 350, and 350 to 600. Check valves are test with Nitrogen to confirm cracking and reseal pressures and for seat seal up to 1000 psig.